#Arvind Kejriwal is so Honest that he always follows Traffic Signals While Playing GTA Vice City also. #Arvind Kejriwal if you continuously take you turns , you will end up running in circle cant move forward. 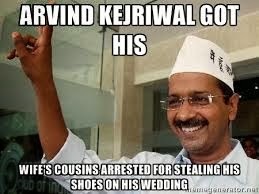 #Arvind Kejriwal refused to purchase an underwear, because VIP was written on it. 1- Roll a blank paper. 2- Say these are proofs of corruption against some leaders. 4- Then give public 'Baba ji ka thullu'. #Arvind Kejriwal with the 'Nayak' movie hero Anil Kapoor, as far i know i never see Anil Kapoor making government with the support of Amrish Puri. #I requested municipality to change name 'Kejriwal Turns' instead of U-Turns in roads. 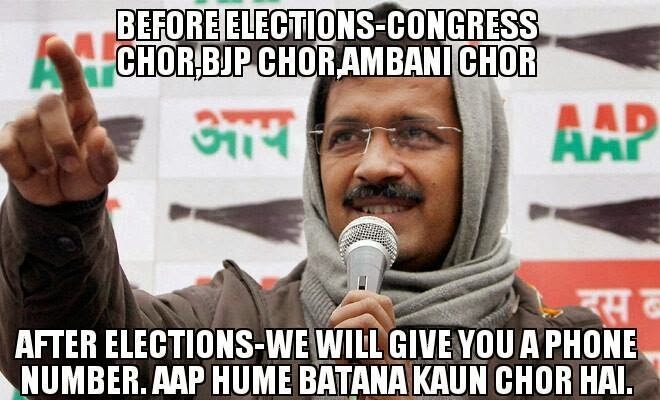 #Arvind Kejriwal is so honest that when he finds a bomb he returns it to terrorists.